One of the many recent scientific discoveries that is best understood in a young-earth creationist framework is the preservation of original tissue in fossils thought to be millions of years old (see here, here, here, and here, for example). So far, all of the examples of such tissue come from animals, but recently, a study was published in the journal Metallomics that indicates at least some plant fossils also have remarkably well-preserved original remains in them! The research team, which includes palaeontologists, physicists, and geochemists, used the Stanford Synchrotron Radiation Lightsource and the UK’s Diamond Light Source to examine fossil leaves which are believed to be 50 million years old. These two facilities use fast-moving electrons to produce radiation that is very intense and very high energy. This radiation can be used to study various aspects of an object that are not possible to study using visible light. 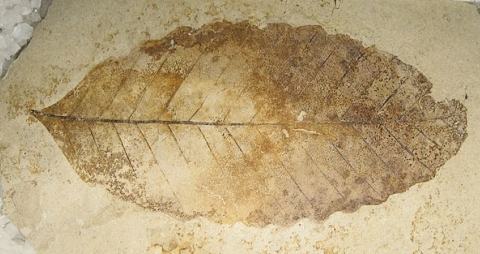 In particular, the research team used the radiation from the facilities to examine the distribution of chemicals found in the leaf fossils. Why did they want to do this? Well, essentially the same team of scientists used a series of tests (including ones conducted at the Stanford Synchrotron Radiation Lightsource) on a reptile fossil that was also supposed to be 50 million years old. They found the chemicals you would expect to find in reptile tissue, and they found them in exactly the places you would expect to find them in living reptiles.1 As a result, they concluded that there was a remarkable level of chemical preservation in a reptile fossil that is supposed to be 50 million years old. They wanted to see if the same thing existed in plant fossils. They found that it did! This evidence strongly suggests that a significant fraction of the chemical inventory of the examined fossil leaf material is derived from the living organisms and that original bioaccumulated elements have been preserved in situ for 50 million years. They also show that this kind of analysis can illuminate other details in the fossils. For example, in one specimen, they were able to show that the leaf contained the feeding tubes made by caterpillars who ate the leaf before it was preserved as a fossil. Once again, the chemical composition of those feeding tubes is exactly what you would expect if they are the remains of the originals. How do the authors propose that this remarkable preservation lasted over 50 million years? They suggest that the copper in the leaf acted as a natural “biocide,” staving off the effects of decomposing organisms. The problem with that explanation, of course, is that copper provides only a short-term preservative effect. For example, copper is used in the preservation of wood. However, none of the wood treated in that way lasts for millions of years! A much more reasonable explanation is that the fossil leaf is not 50 million years old. It is probably on the order of thousands of years old. Doesn’t bio-mass decomposition need a combination of bacteria and oxygen? Is it not equally plausible that this is a result of a combination of biocide killing off the organisms plus some kind of sealing action that prevent new organisms or oxygen access to the bio-material? Or am I just making my lack of understanding of the fossilization process woefully plain? Lawrence, biomolecules are not thermodynamically stable. As a result, they decay spontaneously over time. This is why your body has to continually replace them. They simply decay. Bacteria can speed up the process, but they are not necessary. Neither is oxygen. Certainly a sealed, oxygen-free environment will allow the chemicals to last longer than an open environment rich with oxygen. However, they will still slowly decay, and their elements will diffuse into the surroundings. I see no chemical mechanism by which they would last for millions of years. There are some things, Lawrence, that even science cannot explain! There are some things, Lawrence, that even science cannot explain, yet! Just as evolutionists thought they got around the dinosaur soft tissue conundrum, (which they haven’t, as you covered here: http://blog.drwile.com/?p=11753) this shows up. They must be sweating bullets!